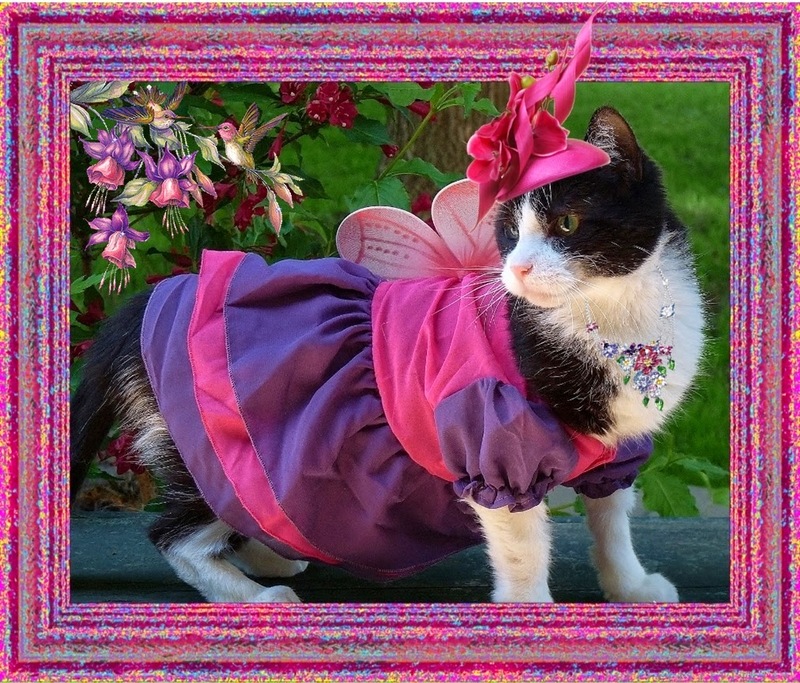 Wendy's 3-D Cats: DOMINO'S SPRING/SUMMER 2014 COLLECTION: IT'S FOR THE BIRDS! DOMINO'S SPRING/SUMMER 2014 COLLECTION: IT'S FOR THE BIRDS! As you may know, Domino is a top fashion model. However, this Spring she has 'branched' into couture design as well. So for the first time ever, may I present Domino modelling her own creations from her Spring/Summer 2014 Collection. 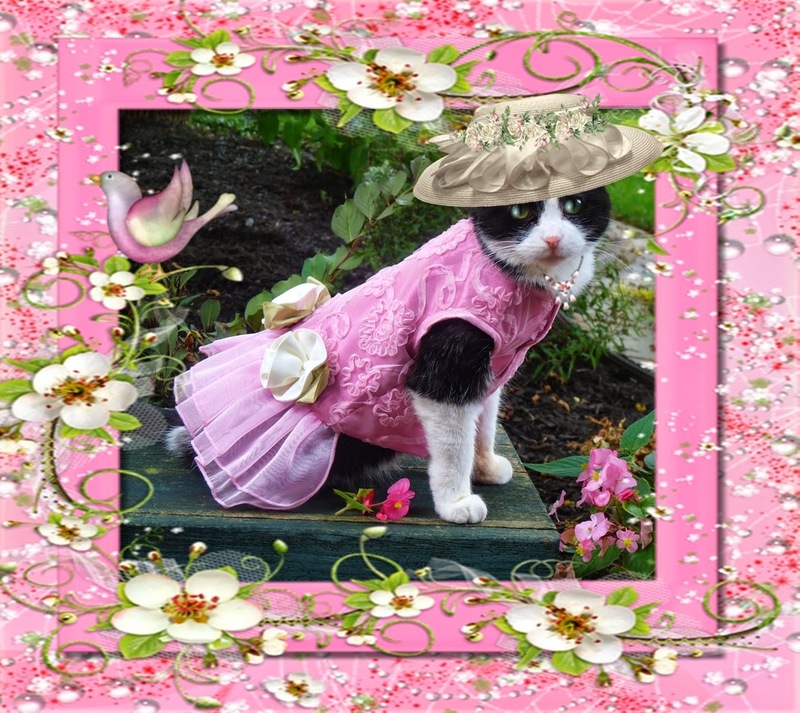 She has dresses and hats for all occasions, from casual to formal and everything in-between. Domino also has a penchant for 'birdies', so she convinced some of her feathered friends to join in on the photoshoot, too. She has even managed to colour-coordinate them with her outfits! Just imagine! 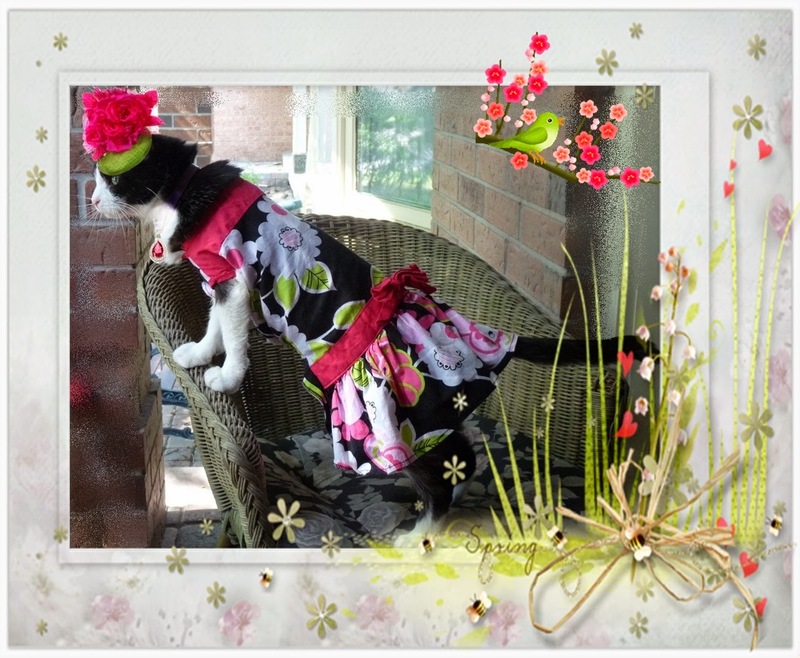 Here is Domino in a jaunty black-and-white with pink-and-green floral frock. Topping it off is a matching green fascinator cap with large hot pink flower. 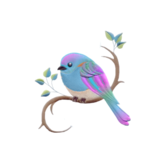 Even "Tweet Thing" (her bird buddy) is green with envy over this one! Domino can wear this simple yet elegant dress to both formal and casual affairs. With its solid black top and white polka-dot pleated skirt embellished with pink bow, it's a classic. 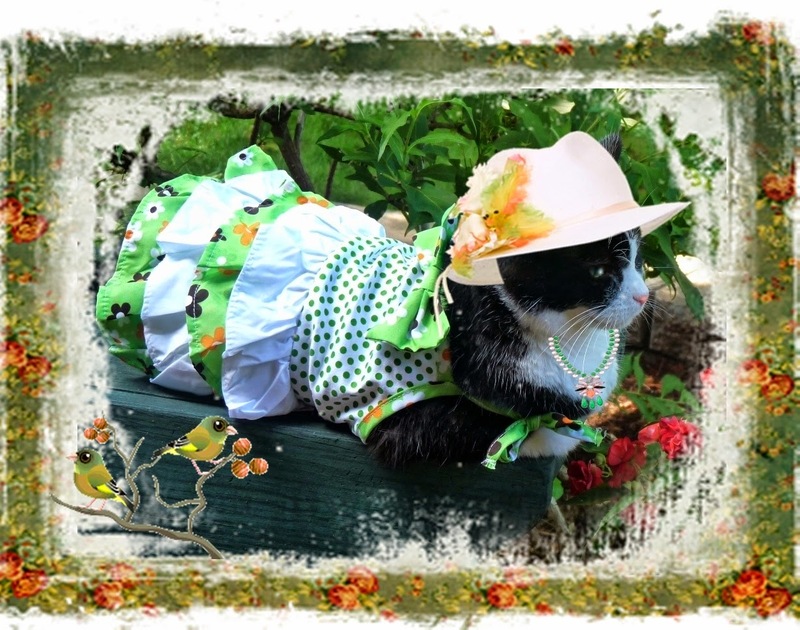 She has coordinated it with a black polka-dot fascinator accented with black and pink milliner's flowers. 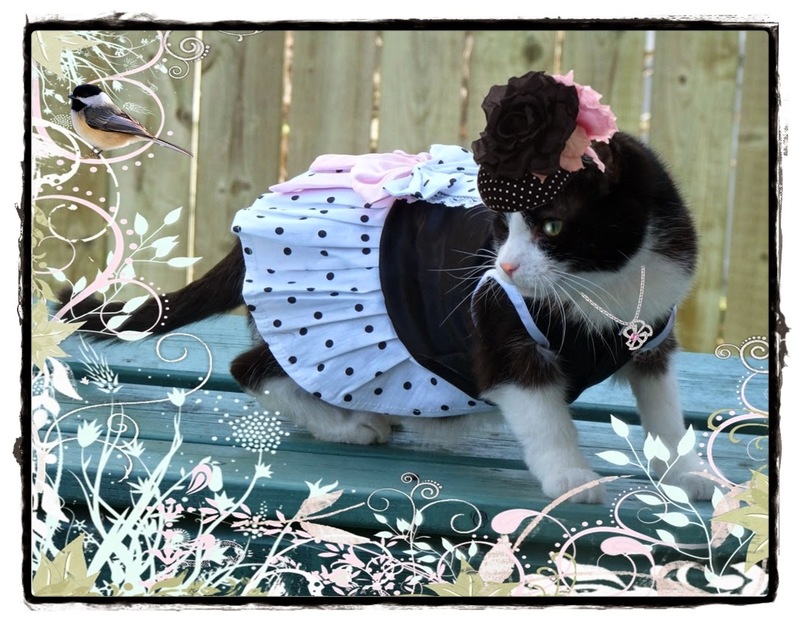 Domino and her chickadee pal are all set for a 'Chick's Night Out'. 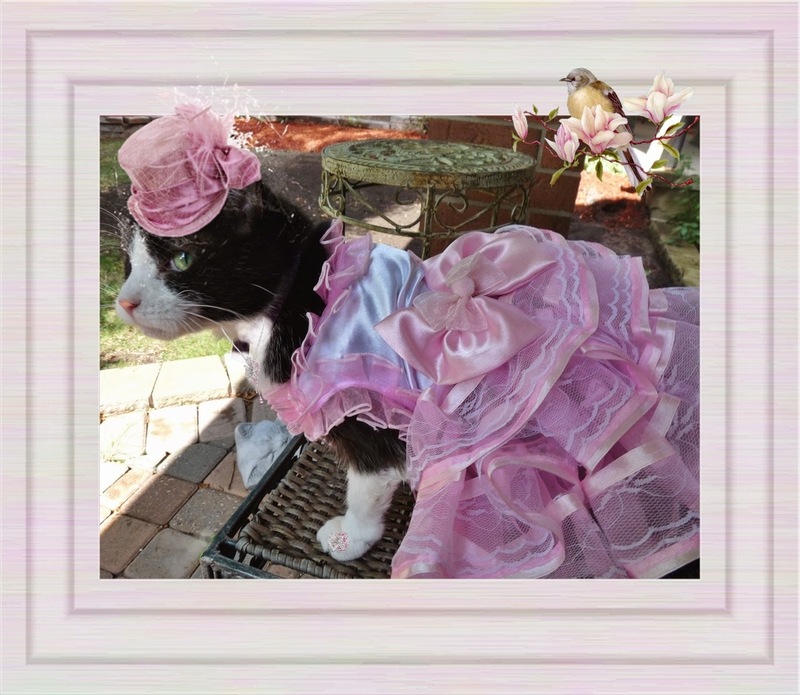 Domino tickles her fancy (and her pink) with this formal number complete with veiled mini top-hat. Her diamond and pink topaz jewels take this outfit to a higher level. Domino and her sidekick make a perfect WRENdering. They are both pretty as a picture -- and pretty in pink! This outfit is cool and casual for those hot summer days. The dress has a crisp white with green polka-dot bodice with a ruffled white and green floral-patterned skirt. 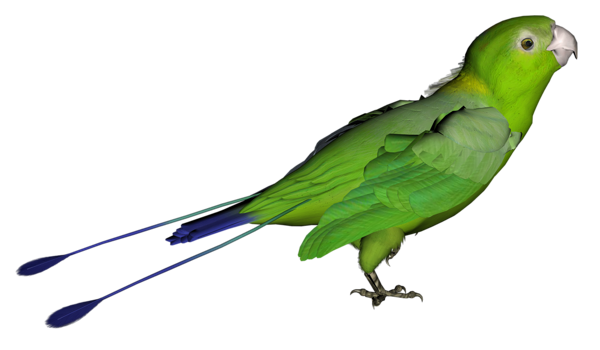 Domino has paired this with a pale fedora adorned with orange, green and yellow feathers. The touches of orange in the outfit are complementary pops of colour which elevate this little number into a fashion statement. Domino and her small green cronies are 'birds of a feather' on this one. 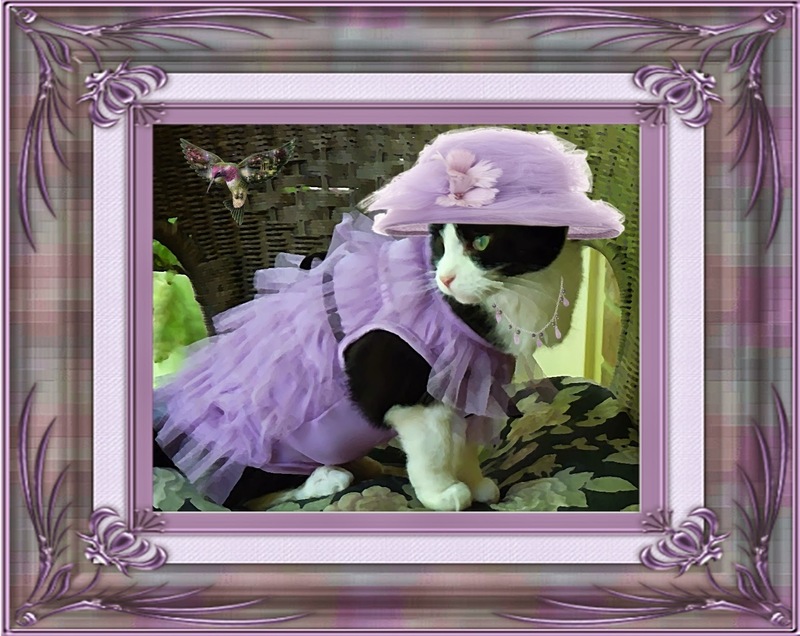 Here Domino is awash in lavender tulle. This outfit is just perfect for a wedding or an afternoon tea party. The dress has layers of ruffles with a black velvet sash at the waist -- and Domino's briolette necklace lends that special little added touch. She and her winged companion are so happy they're humming the same tune. Now that's REALLY touching! Domino dons yet another wedding-appropriate outfit; this time in pink and ivory. The dress is a rosy pink with tulle overlay and is accented with two ivory-coloured roses at the waist. Her ivory wide-brimmed hat is adorned with petal-like satin shapes and a spray of tiny pale pink flowers. 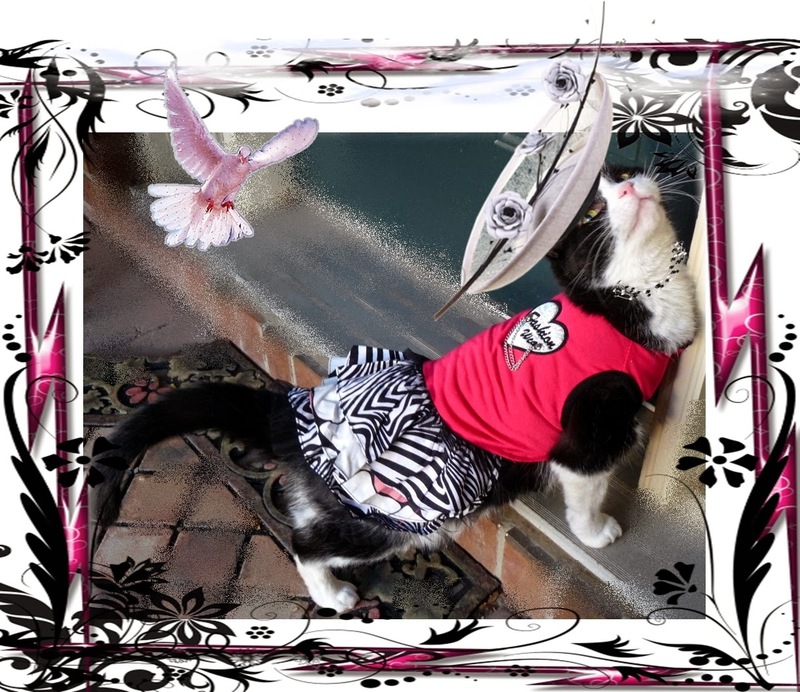 She and her feathered friend are feeling all "lovey-dovey" over this one! As a cardinal rule, Domino loves to sport red -- especially when that red outfit is rather sporty. 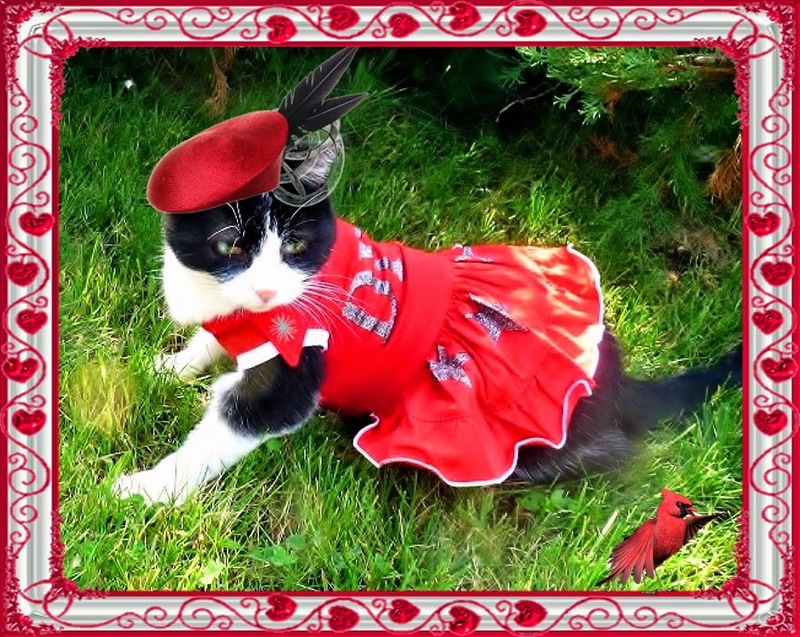 Here she is 'starring' in her bright red DIVA frock with frolicsome feathered fascinator on top of her pretty head. 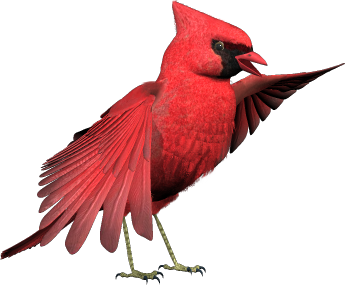 And her chum the cardinal is all in a flap about it! "How fascinatin'! ", says he. This ensemble brings out the animal in Domino. 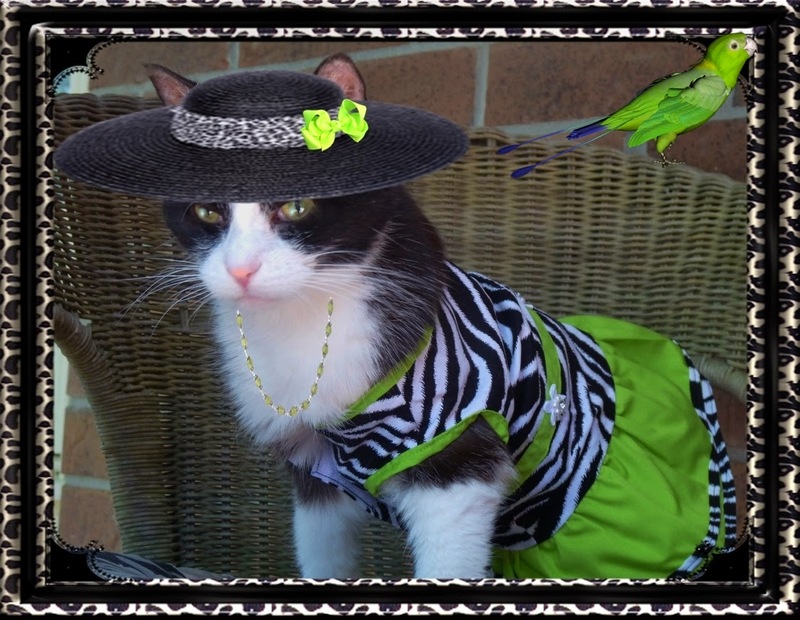 Her dress has a black and white zebra-print top with a double lime-green skirt. Domino's wide brimmed straw hat also has an animal print band and a bright green bow which continues the overall theme. This outfit, though casual, is bright and snappy -- just like Penelope, her parrot pal. "Domino IS a crackah! ", says she. 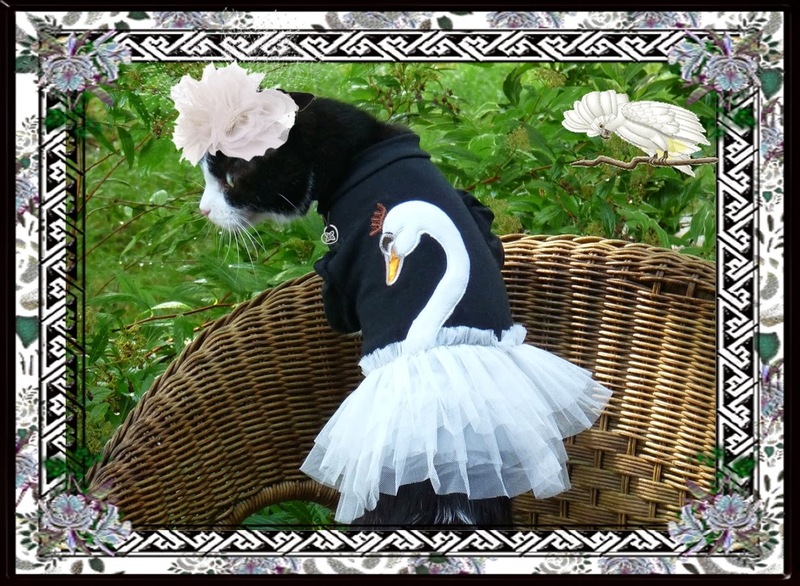 In yet another easygoing ensemble, Domino is swanning around in balletic form. The black cotton-knit T-shirt top is decorated with a white swan whose neck cascades into a full white-net tutu skirt. The white flowers on her head are attached to a black-capped fascinator. It seems Domino was born to wear black and white and this little number suits her to a "T". It appears that she and her compatriot, the cockaTUTU, are in total sync with this one! Domino does the dance and the bird takes a bow. Domino's modelling style is nothing if not dramatic -- as is this fashion-forward little frock! The bodice is hot, hot pink with yet another zebra-print ruffled skirt. Her white elongated bowl-shaped hat is also quite striking. With it's pale-hued roses and black branches, it lends an Oriental touch. Domino has also accented this outfit with black and white floating pearls at her neck. If she's looking above for some love, she's just about to get some as her devotee, the dove, swoops by! It appears that birds -- and cats -- of a feather stick together! 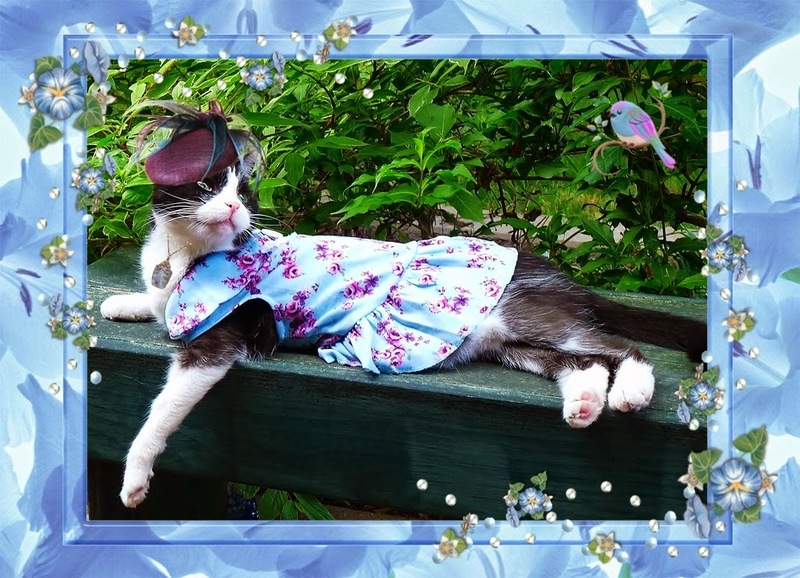 Domino's little blue and mauve pal looks on approvingly as Domino strikes yet another theatrical pose in her fresh blue and plum floral shift with coordinating plum and teal-feathered fascinator. As PURR usual, her choice of jewelry is a perfect match for her outfit, and her choice of friends is pheNOMinal! "I NOMinates yoo ta be my next meal", says Domino. And finally, Domino touches down in Fairyland, where she, herself, turns into a winged creature with benefit of her purple and pink fairy costume. Her bejewelled flower necklace and her bright pink flowery fascinator help her blend completely into her new environment. "My feddered furiends and me is at wun wif nachur", says she. 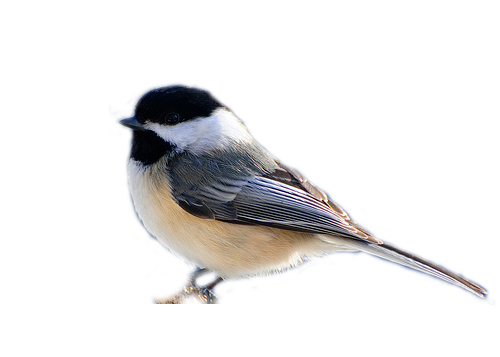 We always knew you were a little wingy, Domino! Now that the fashion show has come to it's inevitable end, the birds are all going to flock off, and Domino's gonna frock off! Until next time, that is.